According to the National Association of Home Builders (NAHB), kitchens (along with bathrooms) continue to be the most popular remodeling projects for American homeowners. That means if you’re considering remodeling your Naples-area kitchen, you’re in good company! However, not all kitchenremodeling projects are created equal. There’s a big difference between a minor “facelift” for you kitchen, in which you might resurface or replace cabinets and a full upscale family kitchen remodel—both in terms of the scope of the project and the price. There’s also a big difference in the styles you can choose for your kitchen. One style definitely doesn’t fit all, so how do you decide which style is right for your kitchen? Part of the answer, of course, depends on your personal taste—and how your kitchen will fit with the style in the rest of your home. Another part of the answer depends on how you use your kitchen. If your kitchen is primarily a workspace for preparing meals, you’ll likely want to give more attention to organizing the setup in a way that allows maximum efficiency. Or you might be more focused on the traditional “work triangle” and achieving ease of movement from chopping/cutting to stirring to cleaning. If your kitchen is the place where the family gathers for most meals, you may give more attention to seating possibilities and ambience. You might opt for “cozy and comfortable” over pure efficiency. On the other hand, if your kitchen is where you entertain guests, you may place a high emphasis on openness and flow of traffic from the kitchen to the family room or dining room. You’ll probably want to avoid narrow spaces in the kitchen so that there’s room for people to mingle. How you use your kitchen will even impact your choice of lighting. You’ll certainly want task lighting for any food preparation, but if family or friends also gather there to socialize, you’ll want ambient lighting to make things more welcoming, as well. When it comes to specific styles, you’ll want to choose something that fits your personality and also works with the rest of your home. We invite you to check out a few possibilities such as this traditional kitchen, or perhaps this coastal casual kitchen, or even this contemporary, high-gloss kitchen. Of course, one of the benefits of working with a design-build remodeler is that you can draw on the expertise of professional designers to help you create the plan that’s just right for your personal preferences. And then you can be confident that the plan will be seamlessly passed on to others within the company for execution—without anything lost in translation! One style doesn’t fit all. 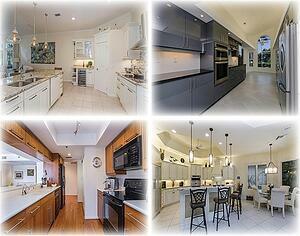 We’d love to help you discover and create the perfect kitchen that reflects your unique style.